As an amateur local food blogger, on random occasions, I get invited to things. Trust me, it happens rarely, but when it does, sometimes I go. So this is how I ended up at a most random lunch, hosted by Chevrolet, for the launch of the Cruze, a new car on the American market. They decided to combine cars, cupcakes, and bloggers. Random, I know! But it was a great day. I got to drive this zippy little car to center city where they were having people take the Cruze for a drive, and then they got a free cupcake! Cars and cupcakes, who would have though? 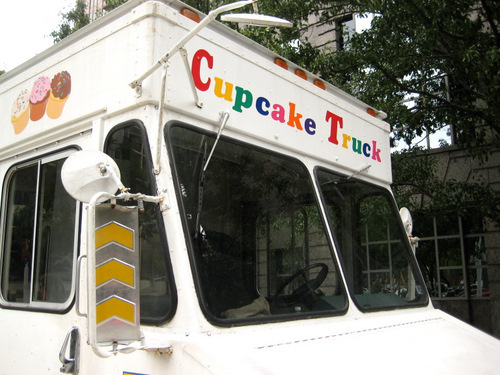 They partnered up with Buttercream, Philadelphia’s original cupcake truck. I love that Kate gave up a career in law for a career in cupcakes. Not a bad trade in my book! More on the actual cupcake at the end of this post, because I didn’t spoil my lunch by eating my cupcake first! They took a couple of us food bloggers and a couple of non-food bloggers for lunch at the Kite & Key. I actually remember when this place opened and had been wanting to check it out, so I was super excited when they told me this is where we were going. H, the other food blogger with us, had suggested it. Thanks H! 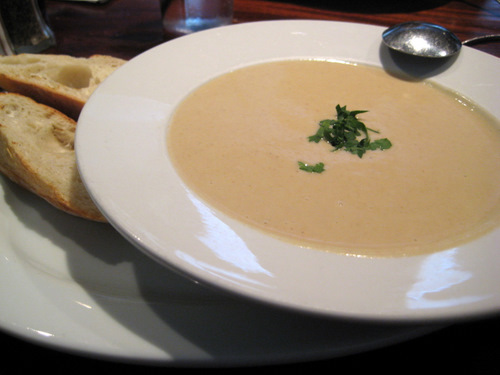 The soup special of the day was this creamy cauliflower and bacon soup. Mmm… a vegetable along with bacon. Kind of takes the health out of it, but it was delicious! And the bread that they served with it? Perfect. It was just perfect. The gnocchi appetizer… I can’t exactly remember how this was prepared but it had cherry tomatoes and cheese, obviously, but what I remember is how good it was. 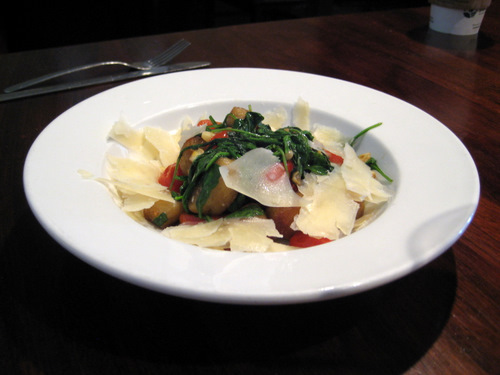 The gnocchi was thick, dense, chewy, and delicious. Since I got the soup, I decided to get an appetizer and not an entree or sandwich. Here are my crepes de bouf. Holy sh!tbirds, this was good! 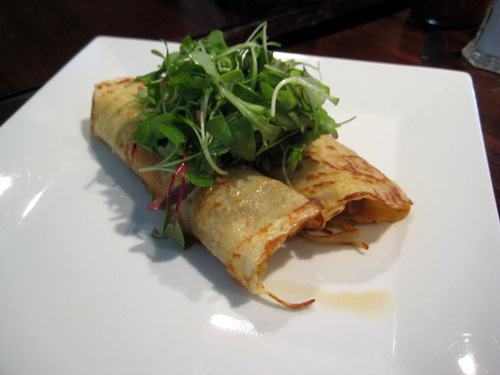 There are crepes stuffed with braised short rib, caramelized onions, and gruyere cheese. It was a sweet and savory flavor bomb. The short rib and cheese were savory, the crepe and onions were sweet, and together, perfect freakin’ harmony. Seriously guys, this was good. H thought that I picked the best dish of all. And I can’t disagree. Let’s move on to the bigger plates. 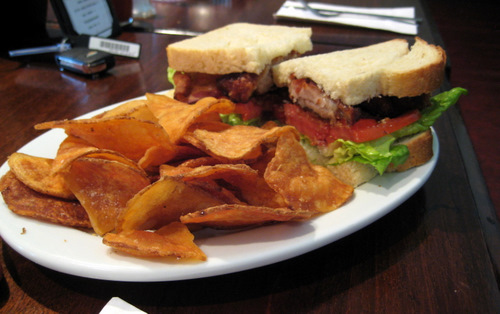 Here’s the PBBLT, the pork belly, bacon, lettuce, and tomato sandwich, served with rosemary mayo and potato chips. There’s a big pork belly theme going on at the kite & key, and I’m a fan of any place who loves pork belly this much. 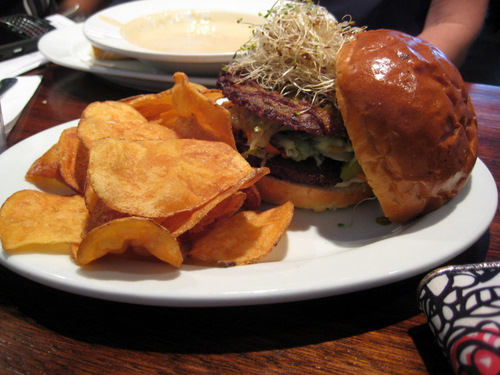 This veggie burger is also quite impressive looking. We have shredded cabbage, asparagus, red pepper, shitakes, carrots, swiss cheese, alfalfa sprouts, and horseradish mayo on a brioche bun. Served with these ubiquitous potato chips. This ain’t no boca burger! But as far as impressiveness from size goes, the fish & chips wins, hand down. 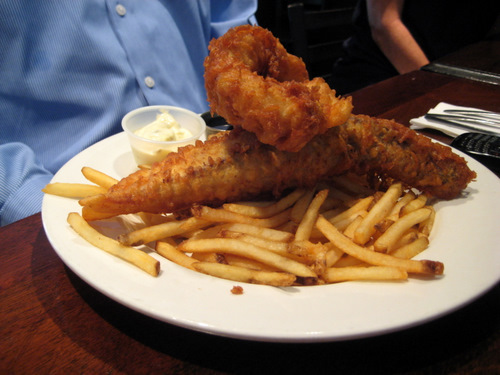 Here we have two ginormous pieces of Yards beer battered fish, piled on top of a plate full of fries. Really though, who can actually eat all of this in one sitting? Finally, it was time for dessert. 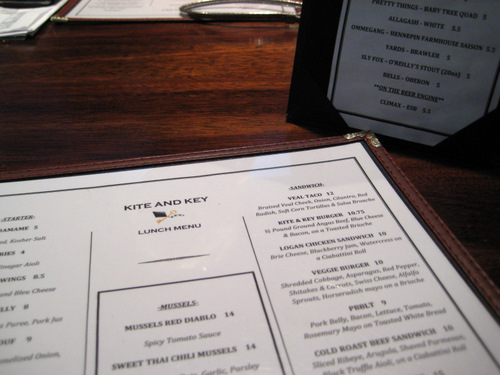 I don’t know how much the kite & key appreciated that we brought our own desserts, but they didn’t say anything to us. 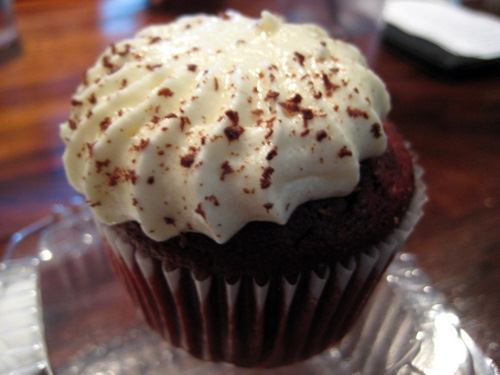 Buttercream has quite a selection of flavors, but I was immediately drawn to the red velvet with cream cheese frosting. Whoa. What really blew me away was the frosting. I am not a frosting girl. In fact, usually when I eat cake, I scrape most of the frosting off. It’s typically too sweet or too thick for me. I like my cake to frosting ratio to be relatively high. But man, this frosting is delicious. It has a light and airy texture, which is the first thing I noticed. And there’s not too much of it. And it has a great flavor without being overly sweet and sugary, to the point of being way too much. Eating this frosting doesn’t immediately make me have to chug a glass of water. The cake part was good too! But not nearly as good as the frosting. This is definitely a first for me! I am a fan! And they have tons of other unique flavors that I will have to check out. Thanks to Chevy and the Cupcake Lady for a fun lunch!